A few weeks ago, we celebrated Purim, a Jewish holiday! You can read all about it here. Purim is one of those holidays that would be CRAZY if more scrapbookers celebrated it. There are just so many opportunities to be creative and artistic, so I really had to reign myself in! One of the traditions we have on Purim is to create gift baskets (called "shalach manot") to give out to friends and family. The baskets/bags/you name it are supposed to contain food items that you say two different blessings on, but besides that, it's fair game. This year's theme was ice cream! 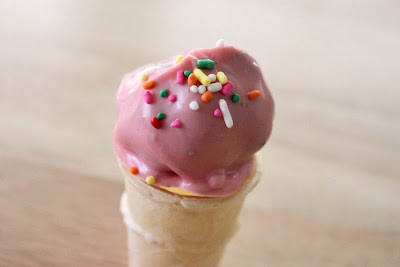 I made cake ball "ice cream scoops" and put them in mini cones, then wrapped them up to place in the containers. I found ice cream cartons on Amazon and ordered some stickers on Etsy! A shot from my Shalach Manot prep mode--living room floor, ipad, and lots and lots of ice cream containers. In keeping with our theme, Ellie was a baby ice cream cone!! How cute is this? After going to hear the Megillah read, and walking around the neighborhood delivering Shalach Manot, a group of my high school friends came over to enjoy the festive meal with us. Ellie's buddy was a cow! If YOU had to pick a Purim theme (costumes + gift baskets) what would you chose? That is really a fantastic theme. Where did you find the ice cream server costumes? Oh my goodness, those cake ball "ice cream cones" and their packaging are so cute! I'm sure you made a lot of people happy with those treats. And, of course, the costumes are all adorbs, too. Given that my husband is a Lego fiend, I think we'd do Legos for our theme. We'd each be a different color Lego and give out boxes of Lego candy. I could see Trevor making Lego baskets to put it all in! Oh my gosh, that sounds so fun! My friend's son was a Rubix cube one year, and they made matching boxes! Your baby girl is growing up fast! Love the community that you describe! I could think of a ton of themes we could do, but if my daughter had her way the theme would be pink. Or maybe stickers!